In today's global economy, identifying and responding to fast-moving financial developments requires an objective framework to analyze and evaluate the opportunities and risks. Senior-level finance executives need a firm grounding in issues like capital structure, risk management, financial technologies, and mergers and acquisitions, to remain competitively relevant. Value Creation and Growth through Innovative Corporate Finance offers a deep dive into the areas of corporate finance required for senior finance executives to make informed decisions and mitigate financial risk, including a macroeconomic view of today's global economy. 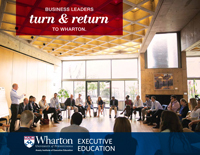 Led by Wharton's renowned faculty, this program brings finance executives up-to-date on issues such as fintech and financial regulations, which are currently changing and disrupting the corporate landscape. Finance executives who must be out in front of such disruptions will benefit from this program. Academic Director Itay Goldstein says this program offers a deep dive into the more complex areas of corporate finance. Professor Itay Goldstein on the depth and breadth of the faculty who teach in the program. Value Creation and Growth through Innovative Corporate Finance makes use of Wharton's world-class academic and theoretical finance research expertise, along with rigorous quantitative analysis and real-world application. This program employs a variety of instructional modalities that enhance the learning experience, including in-class discussions, case work, small group breakout sessions, and role playing. 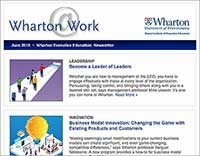 Wharton finance faculty — globally recognized for their research — are responsible for designing and conducting this program, while the participants come from top-ranked international companies. Together, you will explore new and key finance concepts, and expand your global outlook while enhancing your knowledge and performance. In Value Creation and Growth through Innovative Corporate Finance, you will address issues like the capital structure question: Raise funds through debt, equity, or a combination of both? You will also explore real-time concerns like managing cross-border risks in today's global economy, and valuing and assessing the financial and risk implications of strategic decisions. Harnessing these insights can give your organization a competitive advantage in a marketplace where companies are seeking new ways to procure capital, engage in mergers and acquisitions, and increasingly make high-value cross-border decisions. Professor Itay Goldstein talks about Value Creation and Growth through Innovative Corporate Finance in this interview on Wharton Business Radio, SiriusXM. Value Creation and Growth through Innovative Corporate Finance is a fast-paced, comprehensive program designed for senior leaders in banking as well as executives in other industries who have strategic financial oversight of their company/division and wish to strengthen or broaden their understanding of corporate finance. I was particularly interested in the fintech discussions because that’s very relevant to my work. I have a broad knowledge of finance but I don’t know much about the fintech sector. I have seen many startups in cryptocurrencies, in blockchain, etc., but there’s no systematic summary of this industry to tell you what’s good and what the shortcomings are. This class was very valuable because it told me what’s happening in the tech end of finance. It really helped me understand the ecosystem. It was a good update for me since I’ve been away from business school for a number of years. Taking the program has helped me to better evaluate investment opportunities in this sector. I liked the professors. I think they are very professional, not only in certain topics, but they have a broad knowledge base. 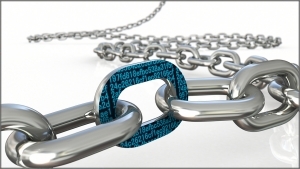 They connected the dots for us, because some participants had experience in certain areas (such as fintech, mergers and acquisitions, startups, large companies) but not in other areas, and wanted to learn more.